To run a zoo is as much a responsibility as fun it sounds. 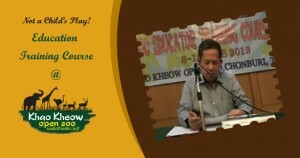 And to be able to take up this responsibility with good confidence and technical skills an educational training course for zoo personnel was launched on Monday at the Khao Kheow Open Zoo. Being a zoo staff not only requires love for wildlife and nature but also immense patience. Handling animals is like handling small children; they can’t speak and can be unpredictable. Hence this was a week long program with an aim to help improve the staff’s knowledge as well as understanding about the different species and their respective zoos. The course was attended by 30 personnel from 7 international zoos across Thailand. It was held in cooperation with the renowned Smithsonian Institute in the USA. « Celebrating True Patriotism: Happy Dragon Day!